Successful Kick off to Week 2! We had beautiful weather to kick off the second of our two weeks of 2016 UK See Blue STEM Camp! We are very excited to welcome 217 campers this year to camp! One hundred forty-five of them started today! Registration went very well this morning and we really appreciate everyone’s patience in getting all the forms UK requires turned in. You all are awesome! Just a note about the consent and assent forms that we ask for every year. Our camp is subsidized by an NSF grant that requires research and reporting to the agency. The purpose of the research is to develop a camp model that promotes STEM careers to adolescents and can be replicated. We also look at students attitudes towards STEM and the impact of our activities. We do not collect test scores or anything similar for your students nor do they have to be a Fayette County student to participate. Without this grant and consent and assent to participate the camp simply would not exist. We never report any names or any individual data…it’s always aggregated together! We will post a blog post each night this week with some highlights from the day and some conversation starters. The conversation starters are meant to help you get over the “What did you learn today?” “Nothin’” or <shrugging the shoulders> we often see at the adolescent age. We’ll also post a link to the photos we are taking throughout the week. If at any time you want a photo removed that is of your child, please let us know and we’ll be happy to take it down. Today the students split up and 1/2 saw Dr. Bruce Walcott and the other 1/2 saw Dr. Isabel Escobar. (If you like TED talks, you can view hers here https://m.youtube.com/watch?v=-wbHD77kMWE) In both sessions students were immersed in the wonderful world of engineering…using their hands to build and explore just as engineers do. Today the students got to experience the awesome world that Dr. Robin Cooper immerses them in! The students got to see a real heart, lungs, and brain today. 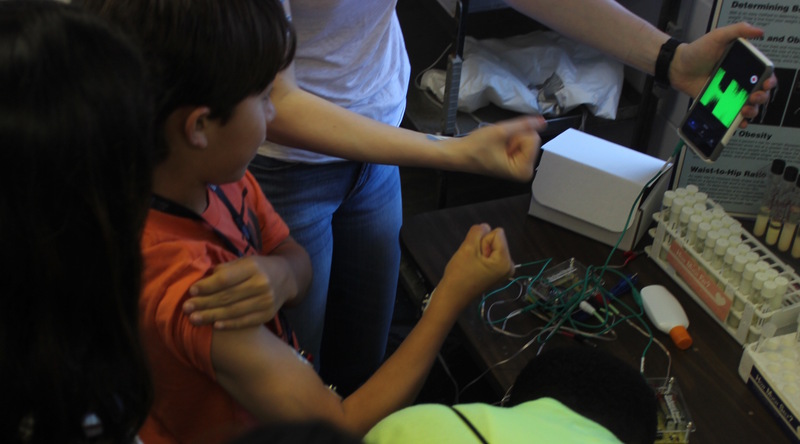 They got to put probes on themselves to measure the electricity going through their bodies. They also got to view and make conjectures about larvae and other fruit fly stages when they were exposed to different colors of light. 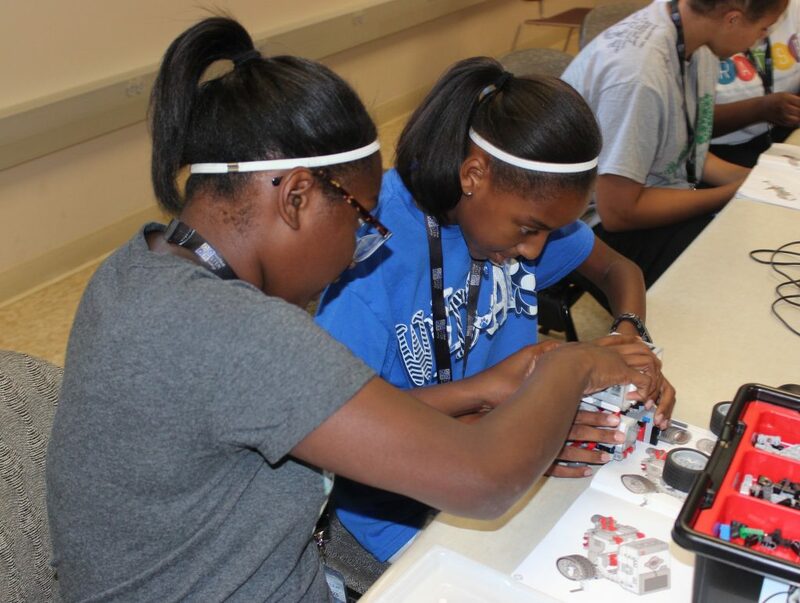 In robotics, students started by engineering their robots. They got to build their robot and get to know it. They always love this part, but we’re eager to continue moving them on to basic programming challenges. We have some exciting new challenges planned for them this week! What did you learn about today that you did not know before? What did you like about what you learned today? Would you like to learn more about this topic? The flavors of engineering, such as: civil, biomedical, mechanical, etc. Conversation Starters… We know that your child is getting to the age where it might be like pulling teeth to get them to talk about their day beyond “It was fine.” “It was fun.” Each day we’ll post some suggested conversation starters centered on camp activities or STEM-related themes. Tell me about how you assembled your robot. Did you follow instructions? Did you just try to figure out what parts went together? Is there a particular field of engineering that you think might interest you? How many pennies did your boat hold? If you could build it again, what would you do differently? What happened when you mixed the powder and water and turned it upside down? How did your fruit flies react to light? What did they do? How did you measure their movement? What was your favorite body organ you learned about? What kinds of things affect its size? Photo of the Day… Each day we’ll post a camp highlight. Click here to go to the pictures. Please note that we try to capture pictures of all the campers, but we cannot guarantee that we will get every single one. We try our very best to though! 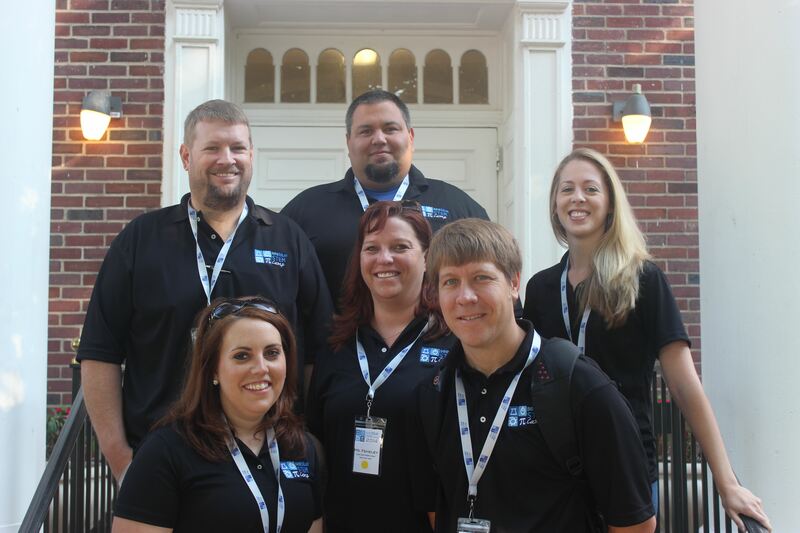 Also we are STEM teachers and not full time photographers, so our pictures are not perfect and we leave them unedited, so if you love to edit photos…feel free! Optical Illusions and 3D Pens! Today was quite exciting with Dr. Jen Eli. 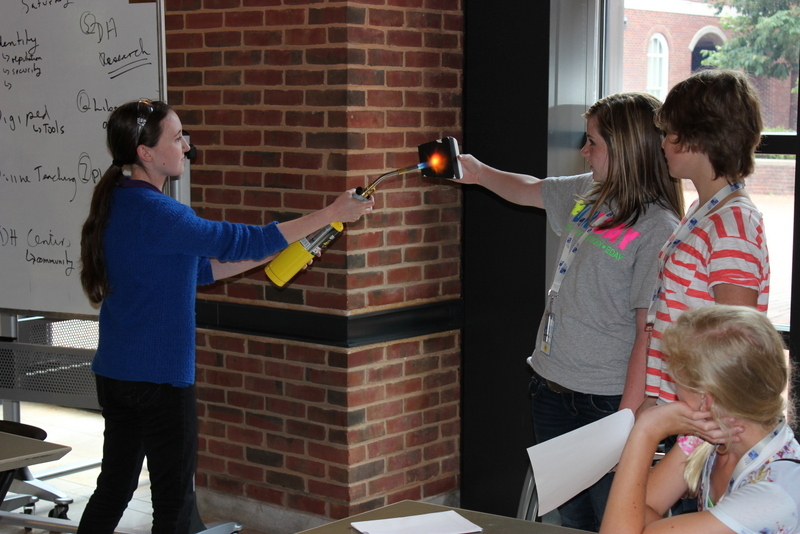 She had the students create and experiment with several different optical illusions. Then she had them creating mathematical models (and other models!) with 3D pens. The students really enjoyed today’s creative outlet session; some probably brought some of the STEM art home with them today! 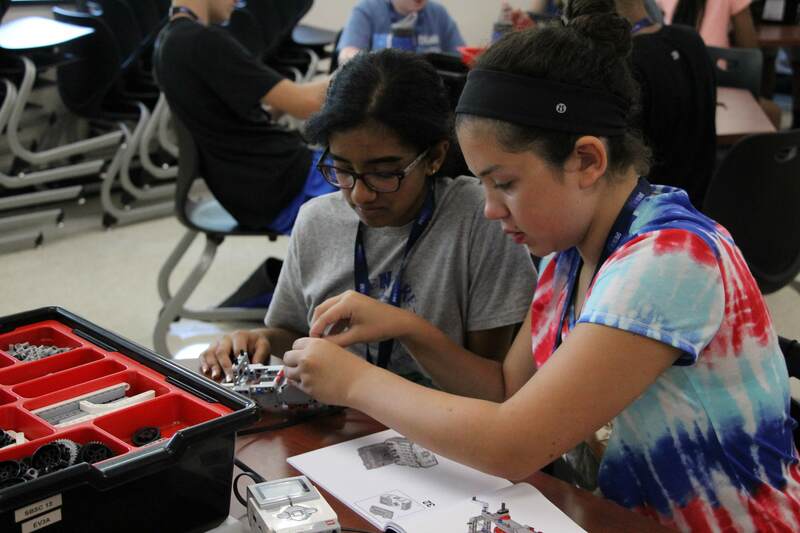 In robotics, they began their programming and started some basic challenges. 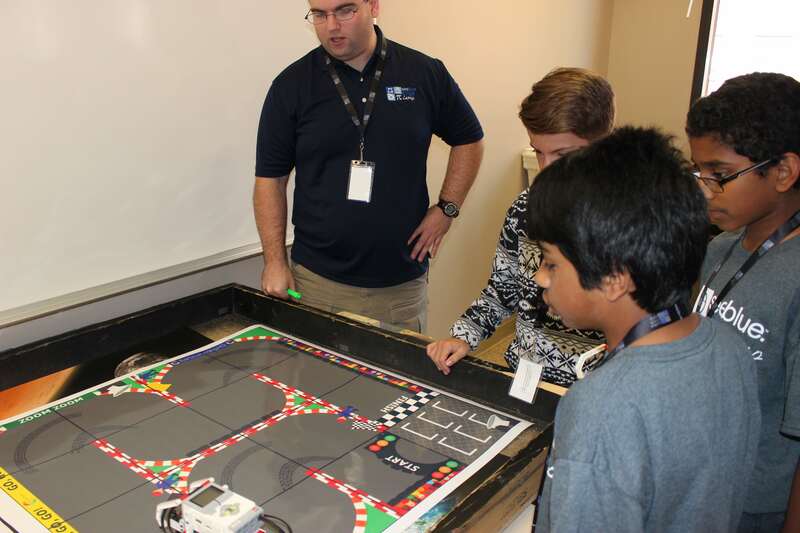 While Lego has some really nice basic challenges to begin with, Mr. Evans and Mr. Randall like to change it up each year and provide students with challenges more appropriate towards the final challenge they will be doing at the end of the week. So today they worked on driving around curves without hitting walls. There were lots of great successes! How neutral colors impact optical illusions. Was there anything you did not like about what you learned today? Nope! Except that we had to stop! I could have gone on forever! No, i had a great time! Would you like to learn more about this topic? Why or why not? Yes, because it is AWESOME + FUN! How do colors affect optical illusions? What did you make with the 3D pen? How does the 3D pen work? 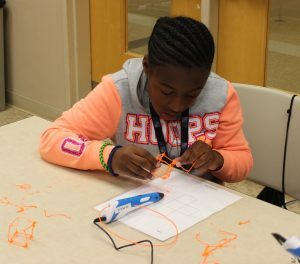 How could you use a 3D pen to build a model? 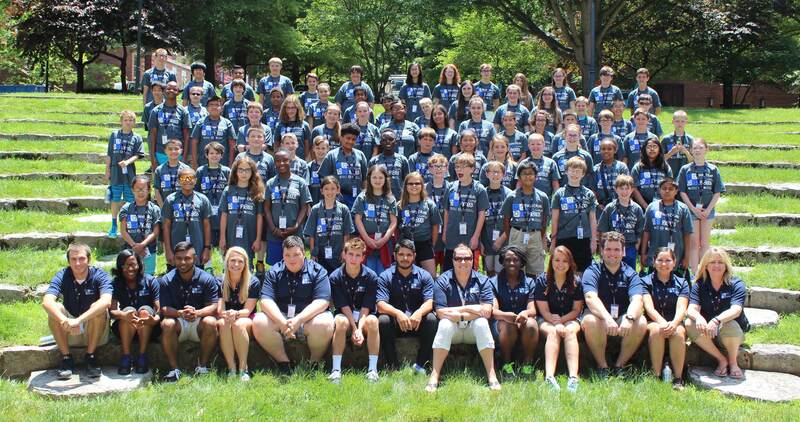 Photo of the Day… We took our STEM Camp photo today! Not all of our helpers are in here, but this is all the students and some of our helpers! Aren’t they a great looking bunch this week? Click here to view the rest of the photos from yesterday and today! Ending on a high note! It’s hard to believe that we’re already at the end of the week! Today was an even busier day since it was the end of the week and the students were extra alive today from all the activity this week. 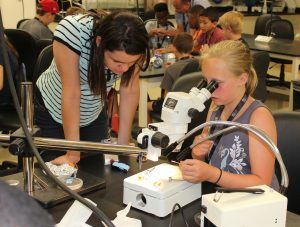 The blue and red and groups got to experience Dr. Brett Criswell’s wonderful awe-inspiring world of nanotechnology. 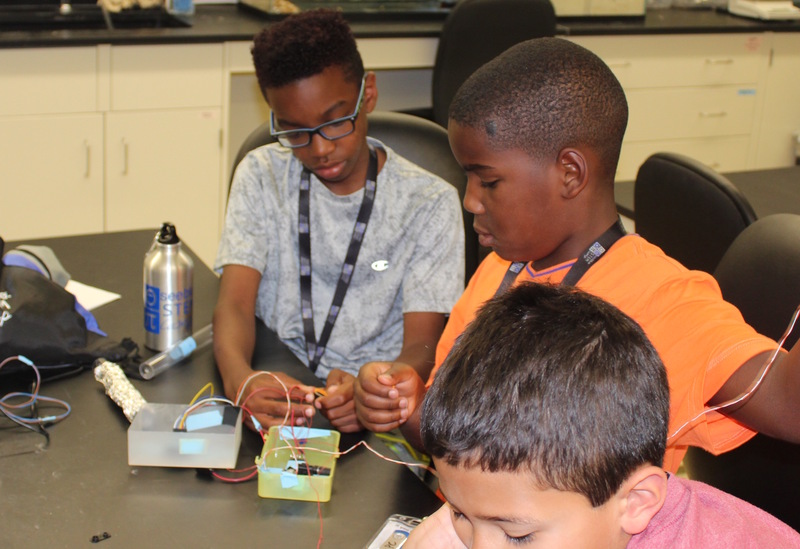 From experimenting with peach fuzz and different types of plants, to talking about polymer-chains found in over-the-counter indigestion medicines, the students were taken to the teeny tiny world of nano-land. 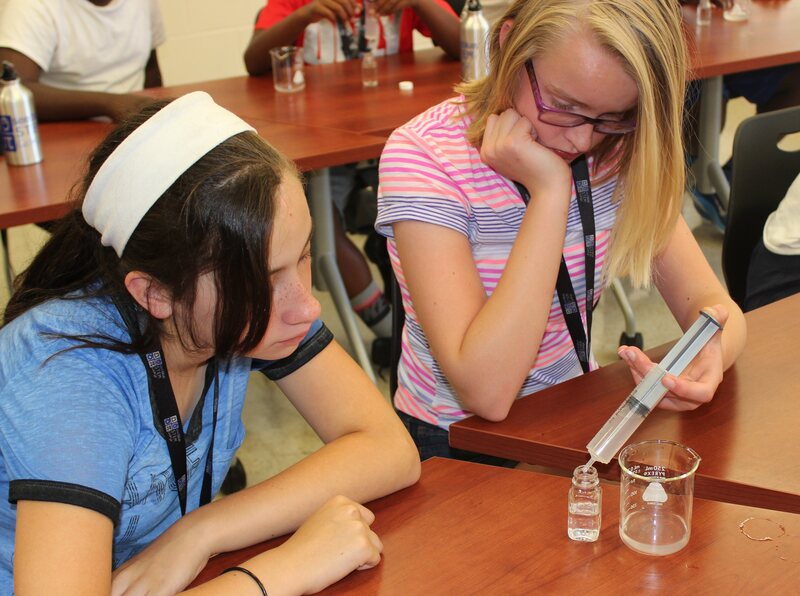 They had a great time conducting different experiments and even remembered such things as Congo Red! 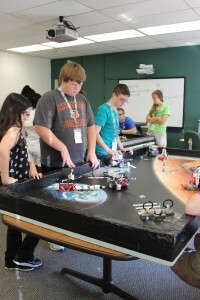 In robotics, they wrapped up an awesome week with finishing many challenges in the green city challenges. There were lots of screams of excitement, joy, and high fives going around as the students became more communicative within their groups and more confident in their programming skills. We tried to capture some video of it today. Clicking on the video will take you to our YouTube Channel where you can view more videos from today. The yellow and green groups got to experience the wonderful world of engineering with our resident engineering expert, Dr. Bruce Walcott. The students got to tour the engineering complex at UK and got to go into many of the different laboratories that UK College of Engineering has. There were faculty and graduate students onsite in the laboratories so they were able to show the students some of their latest research discoveries and experiments and let the students tinker with some of the lab materials as well. Seeing real research happening is always inspiring to the students and they really ask great questions that sometimes even stump the researchers! Of course the favorite again was the sound proof room. I’m not sure what it is about that room, but they always enjoy it! They also built mini motors and talked about simple machines with Dr. Walcott. They really enjoyed the various engineering design activities and applying their content skills. 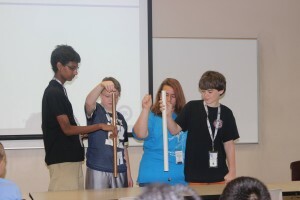 They ended their engineering time with some teamwork activities, including the favorite Hula Hoop Challenge. Students often forget that in the real world, most of our work is done in teams and communication is vitally important. So the students had a great time learning to communicate and talk to each other more. Lego robotics for the yellow and green groups was much more successful today. We even had a couple of groups do all the challenges on the Space Challenge! The Space Challenge and EV3 programming is definitely a lot different from the NXT programming, so some were frustrated a couple of days ago, but were much more confident today. It was such a joy to watch them grow over the past week in this area. They really enjoyed the Space Challenge…it is definitely more complex than the Green City they were used to before! We all had such a great and enjoyable week with the students. 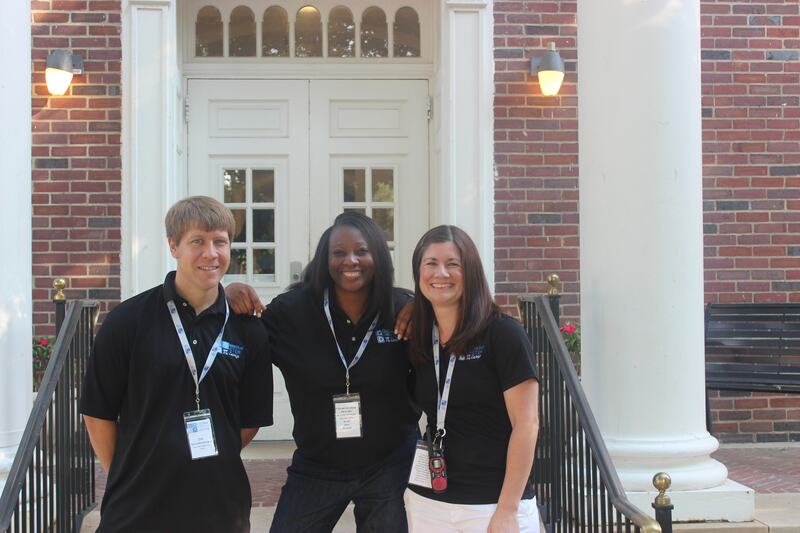 It would not at all have been possible without the tremendous staff that we had this year! I had a bit of a panic moment when (because of snow days) we decided to combine both camps into one week; but some quick creative thinking brought on an awesome opportunity for our preservice teachers in our middle and secondary programs and our doctoral students at UK. Some of the college students took a Robotics class with me prior to camp starting and assisted Mark Evans and Robbie Randall in the robotics rooms and some of the college students just wanted to help out with the camp. 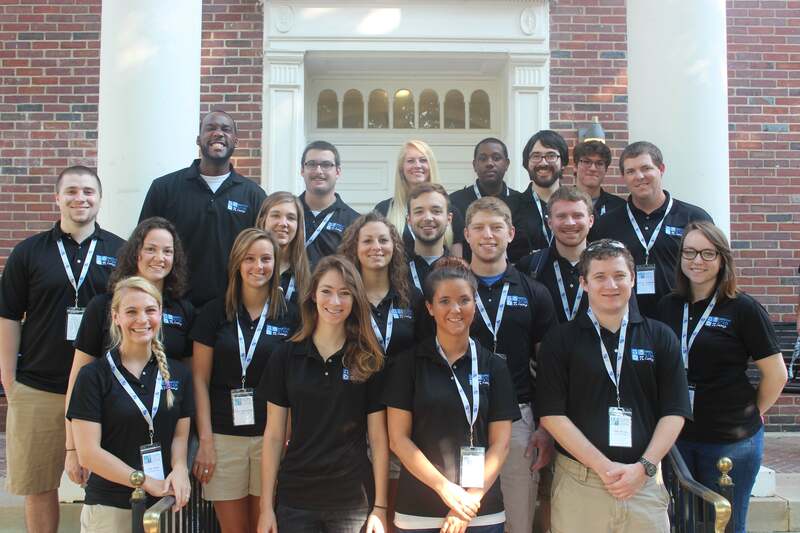 I would like to take the opportunity to introduce you to and thank our staff this year. 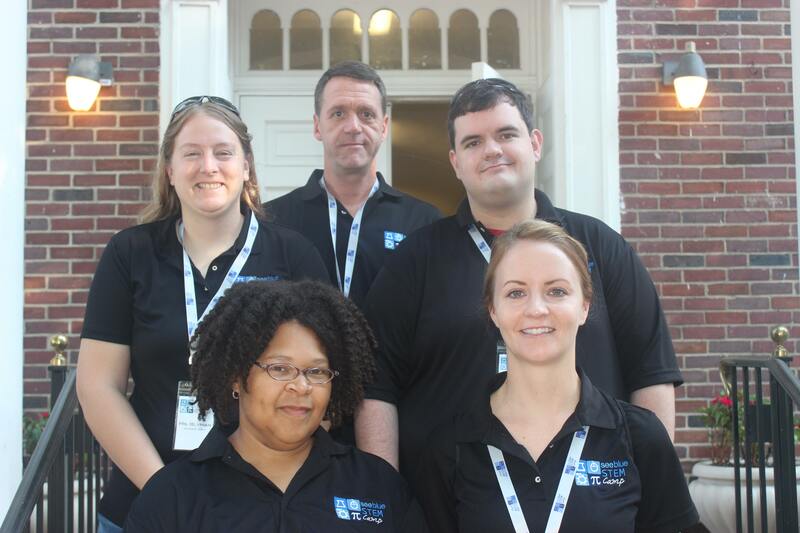 We have a great group of graduate students in the STEM Education department at UK and these 5 are no exception! Our inservice teachers are priceless! 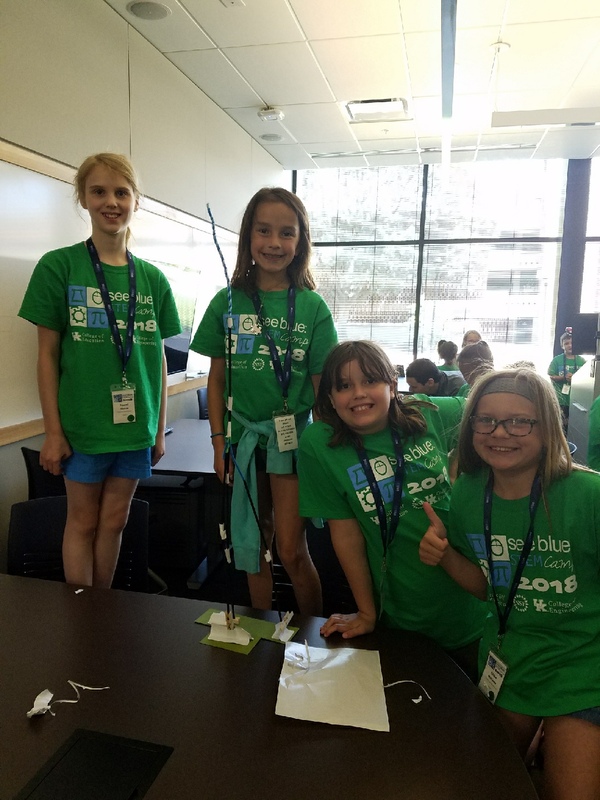 Robbie and Mark take the lead on the robotics, Brooke (Green Group), Tavin (Yellow Group), Megan (Blue Group), and Candice (Red Group) were our team leaders this year, of course Craig is the inventor, creator, and director of the See Blue STEM Camp. 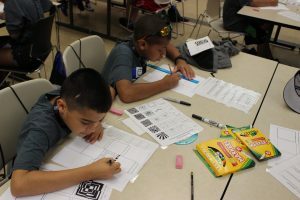 The camp is a way for our inservice teachers to stay connected to the university, provide high quality mentoring to the preservice teachers involved, and even have the opportunity to engage and learn new content and materials alongside the students. Since we were going to 1 week with 144 students, we knew we had needed to have more help. It was an obvious choice to offer the opportunity to the preservice (future teachers) middle and secondary mathematics and science students in our College. Through this unique experience, they got to work with the students in a smaller, low-stakes setting that allowed them to really practice their classroom management skills, their questioning techniques, and work on developing appropriate relationships with students. They were mentored through this process by the high quality inservice teachers as well as the college faculty we had involved. Although they were exhausted by the end of the week, they all stated this was the best learning experience they have had thus far and really enjoyed the opportunity to grow as future educators and felt they gained a lot of STEM content knowledge alongside the students as well. Craig, myself, Christa Jackson, Mark Evans, Gabe Brown, and Bruce Walcott are the team that make up the directors of the camp. We do everything from logistics to food to parent communication to anything else that needs to be done to help things run smoothly. What kinds of things repel water? Why do they need to repel water? How do you make magic sand? Peaches reflect water? I’ve never heard about that. Tell me more! What challenge(s) did you complete in the Green City Challenge? How do you and your partner(s) work together to program and complete the challenges? What was your favorite part about STEM Camp? Out of all the things you learned this week, what was the most interesting? What career do you want to pursue when you get older? What kinds of classes are you going to need to take in order to be successful in your career? What is a sound proof room? What makes it sound proof? What was your favorite lab you visited? What made it your favorite? What challenge(s) did you complete in the Space Challenge? Video of the Day… This video really exemplifies why we do this and why we feel it’s important for students to have these opportunities. We thank you for a wonderful week with your students and hope you have an enjoyable rest of the summer! 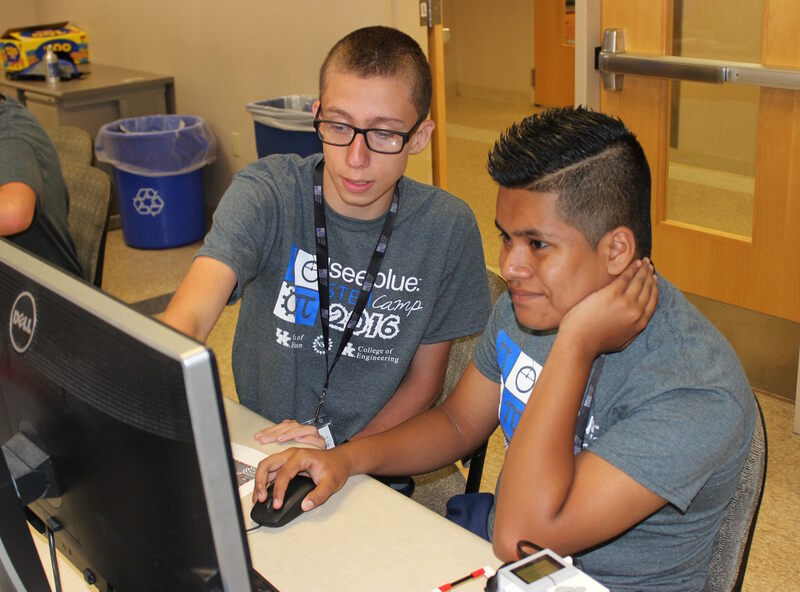 Next year’s camp dates are tentatively set for June 8 – 12, 2015 at the University of Kentucky Colleges of Education and Engineering for rising 5th, 6th, 7th, and 8th graders.